Very cute outfit!!! I clicked the heart to “favorite” that Rebecca Minkoff bag. I see in this post that it’s on sale, and I haven’t received an email notification about that. Just wanted you to be aware. Ah, I’m sure you’re right! Just say no to camouflage pants. Unless of course, you’re in the military or are a kid under 12 years old. That said… Of course you look good in them. It’s amazing how the camo has really taken off in full force!! I have a pair of jeans that I thrifted a couple of years ago, and they get worn SO much!! Heck, even my mom who is 80 has some camo!! Now that’s incredible!! I just purchased 2 pairs of camo pants. TJ Maxx had Sanctuary brand camo pants. I then bought a more casual true camo at Urban outfitters. I wasnt planning on having 2 pairs, but one i can dress up a bit and the other is definitely more casual. Urban outfitters run true to size and Sanctuary maybe a tad bit small. I love the color of yours. You totally read my mind! 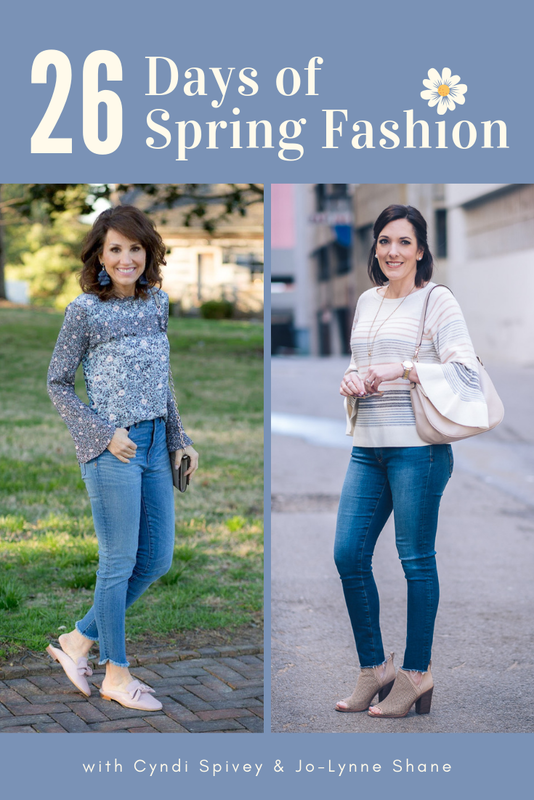 I bought a pair of camo skinny jeans from the Loft that are sooooo comfy and was scouring Pinterest yesterday with ways to style them! Was going to message you with a suggestion on how to style when…wahla…here it is! Thank you! I like the Loft ones a lot – they’re more muted than these. Looks great on you! It wouldn’t be so good on me, thinking of a long sleeve camo top. Love the cameo especially with the boots! Funding very special wedding in two weeks! Yep, I’m definitely one that loves camo! And I really like having camo, other than my hunting clothes, to wear. I am going to look into the ones at Nordstrom since the pair I have from ON are skinny, as well as the tan color ON tee. Both pieces will be staples in my closet, year round. I am learning to try pairing various colors with camo. It is very overcast here today. We need rain bad! Oh, I did pin your look to Pinterest. Have an awesome day! We’ve actually had some rain tonight! Really cute outfit on you! Not sure I could pull it off. I would never buy these for myself but they look cute on you! Good Morning Jo-Lynne! Love your post on the camos. I recently bought a pair of camo moto leggings (they feel more like jeggings) and I’m struggling on how to style them. Could you do a post on white skinny jeans for fall? Have a blessed day! I wear them ALL the time. Can’t go wrong ! I am so glad you styled camouflage pants! I pulled out a pair from a couple years ago and there’s something about them that doesn’t look quite “now” so it’s awesome that you showcased some that are updated! I love this outfit. You look so cute. I think you can pull off the camo. Its the edgy look you like. I love those booties. Do you find in the rain they are hard? I live on the NW coast and so we get similar weather to you it sounds like……except now. Our summer and now Fall have been hot. I’m looking for leather taupe/tan and grey booties to replace my suede ones. My dark wash jeans are fading on my suede booties even though I try to roll or wear them short enough. Great post. It seems that only the young are wearing them here, so I’m going to sit this trend out. I need these Camo pants! I am heading out to Fort Jackson today to attend my nephew’s graduation. Those pants would be so cool! Love them! Love the ruby moto jacket! Such a nice Christmas gift. All the colors are beautiful! Hope it goes on sale soon. Not a camo pant fan, but do see cute tees, jackets, backpacks and sweatshirts I’d purchase. Have enjoyed your new home journey so much, please continue to share inside and out! I wore these too often in the military so I don’t see these as a fun fashion option for me! Maybe my girls would like me to get the old uniforms out and get it tailored to fit them! Family members have worn several pieces and combat boots to Halloween parties through the years! As always you look so cute but I cannot do the Camo pants. Growing up in the Deep South it’s too “ deer stands and turkey hunting” for me. HA! ( not that I would ever shoot an animal!). I am on the lookout for a subdued version of this trend— a muted tee?? Thanks for your continued inspiration and ideas!! Love this look on you. I have a couple pair of camo pants and another way to wear them would be with a more feminine blouse in an autumn-like color like cranberry. It really looks good together. Give it your front-tuck and your cute booties and you have a keeper! Thanks for nudging me out of my comfort zone and into camo. I bought the camo completer jacket from Kohl’s you styled (from last week’s post if memory serves me correctly). The other readers comments about living in the south and camo being for hunters in deer stands cracked me up 😂. I never thought of that! Each region has its own unique culture. Being a Northerner, camo is a cute trend. Will give the Kohl’s camo jacket a try. Love the wine colored moto jacket for your daughter!! Stylish like her Mama! So cute! Just ordered a pair. Have you ever thought about styling the one piece pant suits that are trending? You look great in these. I am so on the fence about camo, particularly pants. Camo was for hunting when I was growing up. I pinned this look to my camo board for inspiration. Omg!!! I love this outfit, I really love it!! !